A freelance architect is an architect that chooses to represent herself and is not tied to a firm. After years of education and obtaining proper licensure, many architects do not necessarily want to have their names lost to the face of a larger firm. Freelance is an option for trained architects who want to be their own boss of their talents and abilities. If you're a trained architect who wants to work from home, you might consider freelance architecture from home as a way to mesh caring for your family and earning income. As a licensed freelance architect, expect to work within a specialty, whether it be residential, commercial buildings or landscape design. 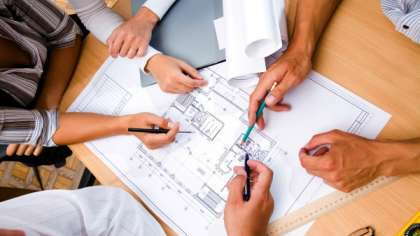 You can offer the same services as architects employed by larger companies, as well as lower-impact counsel. The projects clients need freelance consultation for vary, from laying out a home garden to designing complex commercial structures. To become an architect, freelance or otherwise, you must be registered by your state's Architectural Registration board. To become registered, you must demonstrate your education (a BA or MA in architecture), your experience (usually garnered through an intern program) and your ability to pass your state's architectural exam. The advantages of being a freelance architect are many. Complete control over every aspect of your business is a very compelling motivator. The downside of freelancing is that though you won't be encumbered by the weight and politics of a large firm, neither will you have its support or recognizable name. However, you can manage your own hours and, as much as possible, your own wages. You can incorporate your personal ethics and ideals into your work. Your name may quickly come to be associated with environmentally-friendly designs or large-impact visuals. You can run such a business from a home office, reducing the time spent away from your family. Many clients seeking an architect are grateful for the freelance market. It is a desirable option for companies and individuals seeking general advice who do not want to have to hire a full-time architect for a full-time project. The freelance market also enables those seeking architectural expertise to have the widest selection of available talent. They are not constrained by the hefty prices and crowded schedules of large architectural firms. Many employers prefer the one-on-one contact of a freelancer. A freelancer architect is likely to be able to give plenty of time and attention to her employer, offering as little or as much help as the employer needs. Make sure in your advertising and self promotion that your prospective clients know you are willing to provide this attention. To find freelance work, you can advertise yourself directly, though newspapers, private websites or Craigslist. But, there are many online sites, such as Gofreelance.com and ifreelance.com, that list directories of freelance architects. You can post your profiles to be browsed by people in need of your services. Sites like ifreelance.com list architectural projects awaiting bids. The lister describes what they are trying to build, along with detail of their architectural needs. You can respond with your resumes, ideas and bids. Freelancing is an option if you are an architect pursuing a career that allows you to express your individuality. Though going freelance will reveal new struggles, the benefits of being your own boss might far outweigh them.